The Global Volcanism Program has no activity reports for Norikuradake. The Global Volcanism Program has no Weekly Reports available for Norikuradake. The Global Volcanism Program has no Bulletin Reports available for Norikuradake. Norikuradake volcano consists of an elongated group of small andesitic stratovolcanoes and craters arranged along a N-S line above a ridge crest in the southern part of the Northern Japan Alps. 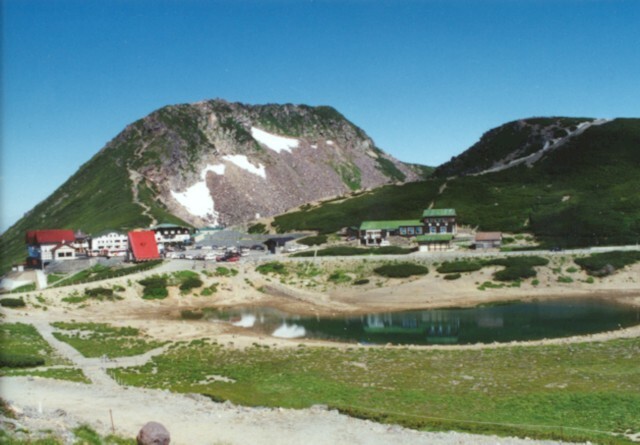 The 3026-m-high andesitic-to-dacitic volcano is the third highest in Japan and lies at the center of the Norikura volcanic zone extending from Yakedake on the north to Ontake on the south. Early eruptions occurred at both the northern and southern ends of the present-day volcano, forming stratovolcanoes that have been largely buried by later southward-migrating eruptions. It was active during the early Holocene, and the last eruption took place about 2000 years ago. Fujita K, Ogawa Y, Ichiki M, Yamaguchi S, Makino Y, 1999. Audio frequency magneto-telluric survey of Norikura volcano in central Japan. J. Volcanol. Geotherm. Res., 90: 209-217. Okuno M, Nakamura T, Moriya I, Hayakawa Y, 1994. Radiocarbon ages of wood charcoal just below the Kuraigahara tephra from Norikura-dake volcano, central Japan. Bull Nagoya Univ Furukawa Museum, 10: 71-77 (in Japanese with English abs). There is no Deformation History data available for Norikuradake. There is no Emissions History data available for Norikuradake. 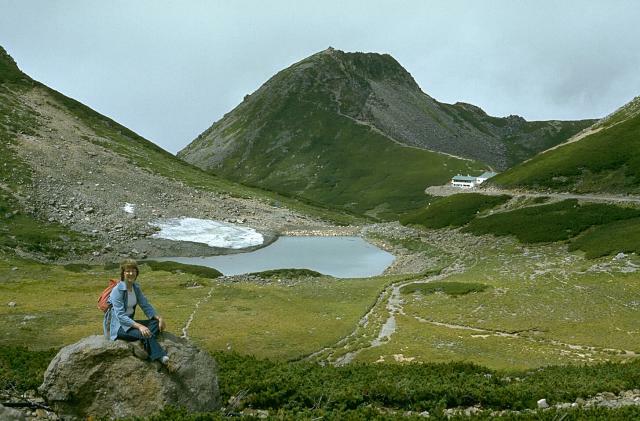 The broad summit of Norikura volcano contains many small peaks and craters. The east (right) side of Enko-dake (center) is cut by the Kamega-ike explosion crater. Tsuruga-ike, another explosion crater, is the pond in the center of the photo. Norikura volcano consists of a group of small andesitic stratovolcanoes and craters arranged along a N-S line above a ridge crest at the southern part of the Northern Japan Alps. The latest activity occurred during the Holocene, and the last eruption took place at the summit crater of Ichino-ike. 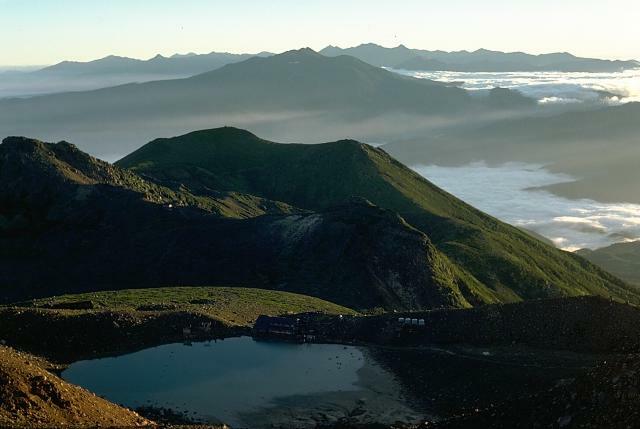 Ebisu-dake lava dome in the background and Tsuruga-ike crater lake at the lower right occupy part of the elongated summit complex of Norikura volcano in central Honshu. A highway leads to the summit of this 3026-m-high volcano in Japan's Chubu Sangaku National Park. Large Eruptions of Norikuradake Information about large Quaternary eruptions (VEI >= 4) is cataloged in the Large Magnitude Explosive Volcanic Eruptions (LaMEVE) database of the Volcano Global Risk Identification and Analysis Project (VOGRIPA).